Whether you’re just getting started with social media marketing, or you’re an experienced marketer, there’s always something new to learn. Asking the right questions can improve your chances of success and help you avoid costly mistakes. In order to help steer you in the right direction, we’ve compiled a list of some common social media questions you might be dying to ask. 1. Do I Have to Be on Every Social Network? Here’s why: As tempting as it is to increase your visibility by jumping on every social network, a lot of times it’s too much to take on. Instead of creating accounts just for the sake having a profile, get strategic with the networks you choose. An easy way to figure out which social networks to be on is by simply asking where’s my audience’s attention? If they’re not on Pinterest, there’s no need to spend a bunch of time and energy there. Check out our social media marketing guide to help decide which network is best for your brand. Another good litmus test for which networks to choose is by asking yourself what value you can bring to the network. If you can’t create content that people on the network want to see, put your efforts elsewhere. For instance, if you have the time and resources to make outstanding videos, then you should definitely have a presence on YouTube so you can share those videos across the networks your audience loves most. If you don’t have the bandwidth for video production, get off of YouTube and don’t feel guilty about not being there. Remember, you don’t have to take on everything at once. Start out with one or two profiles. If you see success and have time to expand, then slowly add other networks. 2. Do My Social Media Handles Have to Be Consistent? Here’s why: Not only will it be easier for you to promote your social media handles if they’re consistent, but it will also be easier for fans to find and tag you. When usernames are different across every network, it can get confusing. If you Tweet an Instagram image but you have two different usernames, it complicates things. Inevitably, someone will tag your Twitter name on Instagram or your Instagram name on Twitter and you’ll miss opportunities for engagement. Today it’s not only domain names that matter; usernames are just as, if not more, valuable in terms of digital real estate. 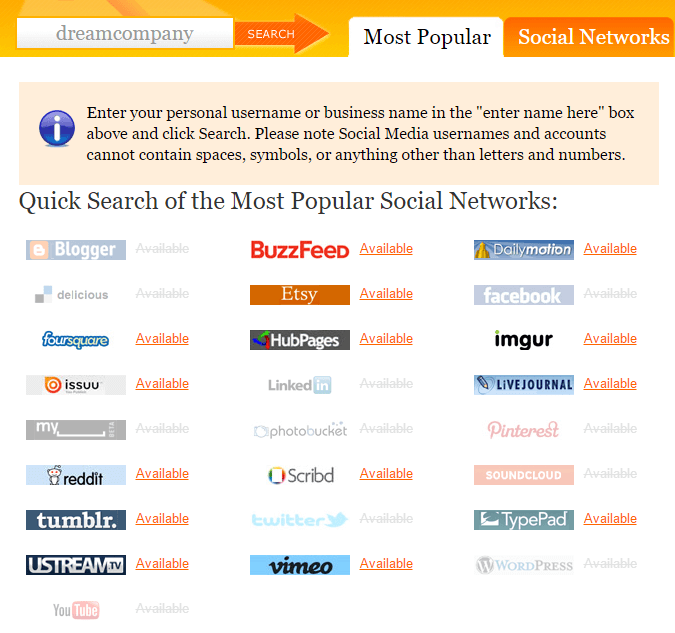 Sites like Knowem tell you whether or not your desired username is available across multiple networks. If your first choice isn’t available, don’t despair. Get creative. And it’s okay if your social media usernames are slightly different than your URL. What’s more important is that your usernames are consistent across each network. For instance, the toothbrush subscription company Quip was unable to get the username Quip on social media. So instead, they used GetQuip and kept it consistent across all their social channels. If your exact username isn’t available, don’t sweat it. Use an alternative like “Companyhq” or “getCompany.” One thing you should avoid is adding numbers, characters, underscores or phrases that have nothing to do with your business. Keep your usernames as simple as possible. 3. What Type of Content Should I Share? Answer: The type of content your audience wants to see. Here’s why: It all comes down to knowing your ideal customer. If you have a solid understanding of their lifestyle, desires and pain points, it will become much easier to create or find relevant content they’re likely to enjoy and share. Beyond that, start following influencers in your industry who create outstanding content and share their stuff. Or you can use it to inspire you to write a few blog posts or conversation starters that riff off the topic or expand upon it. You can also search relevant hashtags or check out what’s trending on Twitter and Instagram to understand what people are talking about right now, then join in on those conversations. Idea generation is the hardest part, so let your audience do it for you. Talk to your followers or ideal customers and ask them what they would like to see. You can also ask your employees to contribute one blog post per month. When you divvy up the work, it becomes less stressful and more thoughtful. Here’s why: Your posting frequency depends on your resources and audience. Your goal is to get quality content that your audience will love in front of as many eyes as possible. Never sacrifice quality for quantity. It’s better to put nothing out there than to publish content that’s subpar. If that means you can only post on Facebook three times per week—but they are three really good posts that get a lot of engagement—that’s perfectly acceptable. Just find a consistent schedule that you can maintain. If you’re struggling to publish on a consistent basis, you can always repurpose content. For instance, if you made a YouTube video, take 30-second segments of it and post them on Instagram. Old blog posts can be Retweeted with new phrasing and imagery. In fact, you can set a strategy in which every blog post gets shared across every network on day one, a repeat on Twitter on day three, a repeat on Facebook on day eight and so on. If you share the same content across networks, each post should be phrased differently. For example, LinkedIn doesn’t use hashtags, so you wouldn’t want to copy and paste something from Twitter. An infographic might perform better on Pinterest than on Facebook. You’ll have to track what kind of content and format does best on each network using social media analytics software. Take that data into consideration when publishing on each platform. 5. What’s the Best Time to Post? Here’s why: We actually have an entire post on the best times to post to social media. The reality is there is no single best time to post. It all depends on the network you’re using and when your audience is most active. It’s going to take a little trial and error to get your timing down. 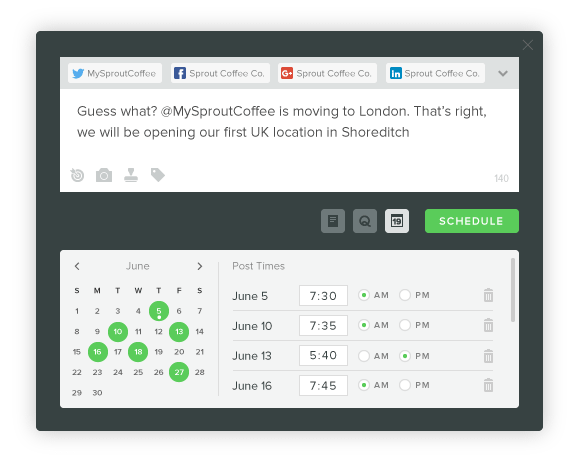 A good idea is to use Sprout to schedule your content to be shared at different times and days of the week. Then dig into your analytics to see which posts are getting the most engagement to get an idea of when the best time to post is for your audience, on each specific network. Here’s why: Regardless of which network you’re talking about, it’s the quality not quantity of followers that matters. You need followers who will actually engage with your content, not just add to your follower count. Since people are bombarded with content from all over the place, you have to give them a compelling enough reason to follow you. You’re not just asking people to follow you. You’re asking for their attention which is a limited resource. Why should they give their attention to you instead of someone else? There are plenty of ways to earn their attention. For instance, Taco Bell gets people to follow them on Snapchat by sharing exclusive content that fans can’t see anywhere else. Another approach is to share exclusive industry news and events. This tactic works particularly well on Twitter because 86% of users use it to get news. NFL insider Ian Rapoport gained over 1 million Twitter followers by being a reputable source of the latest news in the NFL. 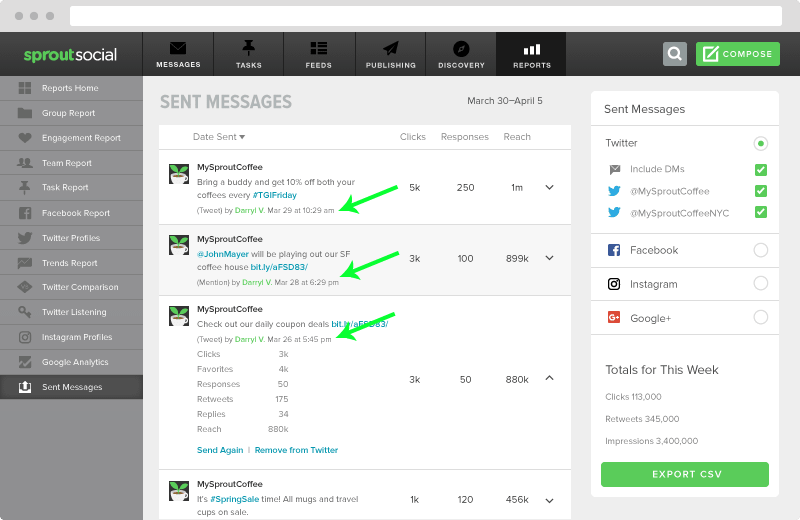 Another popular tactic is to share coupons, deals and giveaways exclusively for social media followers. National Geographic recently launched their Wild to Inspire Instagram contest where users had to submit videos that showcase wildlife or people making a difference for animals in the wild. Beyond that, using appropriate hashtags (especially on Instagram) and potentially partnering with influencers for co-marketing campaigns to expand your reach are great ways to get engaged followers. Also, Remember that social media is a conversation, not a broadcast. Respond to your followers and interact with them. Go where they are. Get involved. 7. Does Social Media Affect SEO? Answer: It can, but indirectly. Here’s why: One common misconception about social media and SEO is that getting your content shared on social media will help improve your rankings. Google has flat out stated it doesn’t count social shares in its algorithm. Social shares are easy to manipulate, so they aren’t the most reliable metric to decide the value of a piece of content. However, social media can still help your SEO efforts indirectly. You can use social media to network with influencers like bloggers, editors and journalists. These are all people that can potentially link to your website in their own content, which can help your SEO. By using social media to build relationships with the right people, you can even land guest blogging or interview opportunities. Just be cautious of spamming people. You don’t want to come right out the gate begging people to link to your content. Instead, build relationships organically by liking, sharing and replying to their content. Build familiarity first, then when the time feels right look for an opportunity to work together. 8. Should I Connect With Everyone? Here’s why: You don’t always have to “follow back” on Twitter or Instagram or accept every LinkedIn request. Why? Because you’re curating a network. Who you follow says as much about your brand as who follows you. It’s ok to be selective about who you follow. The downside of following a bunch of people is it makes it difficult to sort through your feed and see the most important messages like mentions of your brand or products. A good workaround is to use a social media management tool to manage your incoming messages. Sprout’s Smart Inbox makes it extremely easy to isolate messages that require a response. Also keep in mind that you don’t have to follow people to engage with them. You Like Tweets or Instagram posts or leave comments whether you follow them or not. 9. Should I Pay for Social Media Advertising? Here’s why: On a platform like Facebook, you have to “pay to play” in many cases. In 2016 alone, organic reach dropped 52% for publishers. And with Twitter and Instagram following in the footsteps of Facebook with an algorithmic feed, it’s becoming increasingly difficult to get your content seen organically. Whether or not you decide to try your hand at social media advertising will depend largely on your budget. If you can afford to spend some money to promote content on social media, it might be worth experimenting with. Decide on how much you’re willing or able to spend first, then create an advertising strategy within it. Facebook is by far the most popular platform marketers use for social media advertising. In Social Media Examiner’s Social Media Marketing Industry Report, 84% of respondents said they use Facebook ads. However, Twitter, LinkedIn, Instagram (via Facebook), YouTube and other networks offer advertising as well. Feel free to test out different platforms to see which works best for you. In addition to getting engagement on your posts and growing your follower count, you can also use social media advertising to generate leads, grow your email list or get more eyes on a piece of content. 10. Do I Need an Editorial Calendar? Here’s why: If you fail to plan, you plan to fail. An editorial calendar is a necessary step in bringing your strategy to life. It can help you stay on track and consistent in messaging across various networks. It can also help you create quality content by planning ahead. When you see the entire month across all networks in one place, it’s easier to edit the copy for strength and consistency. Also, when you’re planning ahead, you have a better chance of maximizing your impact on social media. You’ll have time to plan a distribution strategy for any upcoming content, instead of doing everything as it happens. For instance, if you know you’re going to launch a contest or sale at the end of the month, reach out to influencers in advance and gain some momentum. Content will be more likely to go viral if you’ve already lined up influencers to Tweet about your product launch or big announcement the same time you do. 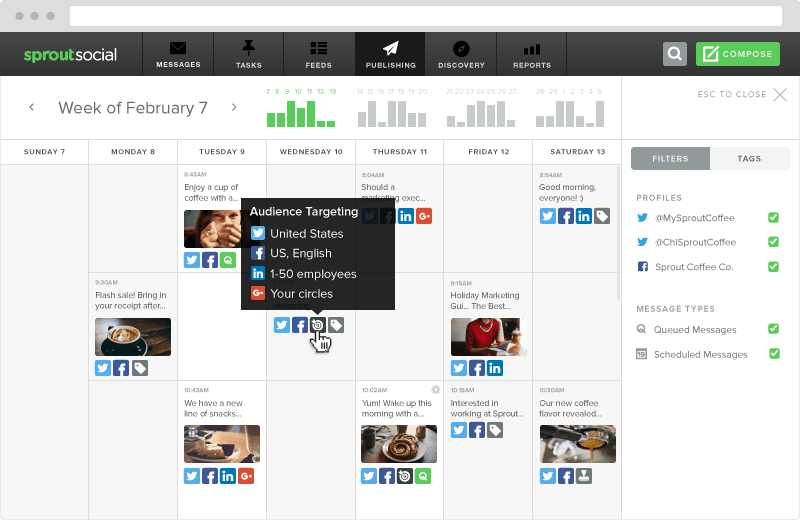 Check out this post that outlines four steps for creating a social media editorial calendar. 11. What’s My Social Media ROI? Answer: The amount you earned from your social campaigns, minus the amount you invested. 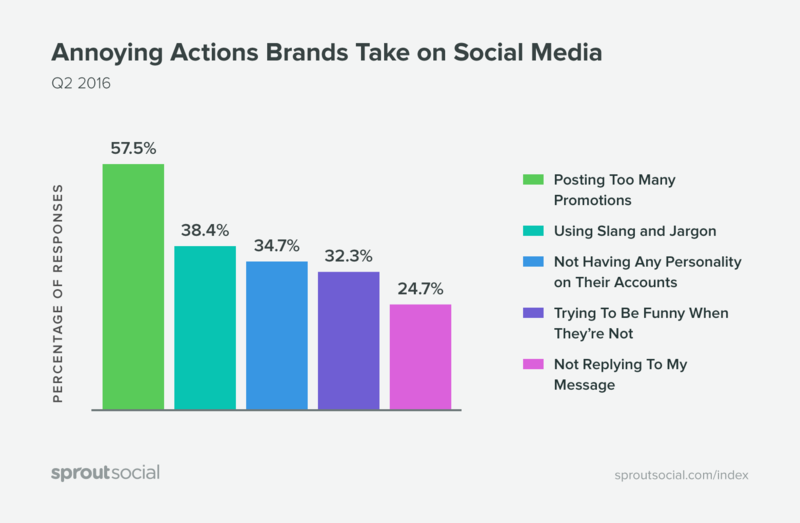 Here’s why: Social media ROI can be a tricky subject, and 41% of companies say they have no idea whether or not their social efforts are paying off at all. But calculating the ROI isn’t as difficult as you might think. Read our guide on how to measure social media ROI for a complete step-by-step walk-through. Keep in mind ROI might look different depending on your goals. If you’re using social media to get leads, your return won’t be the same as it would if you were using it to build brand awareness. 12. I’m in a “Boring” Industry, Do I Still Need Social Media? Here’s why: Social media isn’t just reserved for athletes, fashion brands and retailers. When it comes to marketing, your goal is to reach your target audience where they’re paying the most attention. And for the past 10+ years, that has been social media. A whopping 78% of Americans have at least one social media profile, so there’s a strong chance your target customers are on at least one of the major networks. If you’re unsure which network to reach your audience on, we’ve compiled a list of the demographics of some of the most popular social networks. That’ll give you a nice starting point, but also make sure you dive in and get familiar with any network you’re interested in joining. Remember, social media isn’t an advertising platform for you shout your message as loudly as possible. Instead, use it as a platform to educate and entertain your audience. For instance, taxes are about as boring as it gets for most non-accounting people. But H&R Block puts together fun social media campaigns that don’t make you cringe at the thought of tax season. 13. Is It OK to Share Promotional Content? Answer: Yes, but don’t overdo it. Here’ why: There’s a fine line between using social media to promote your brand, and spamming. If every other Tweet from your company is promoting your products and services, you risk losing your audience. Our Q3 2016 Index found that posting too many promotions is the most annoying action brands take on social media. 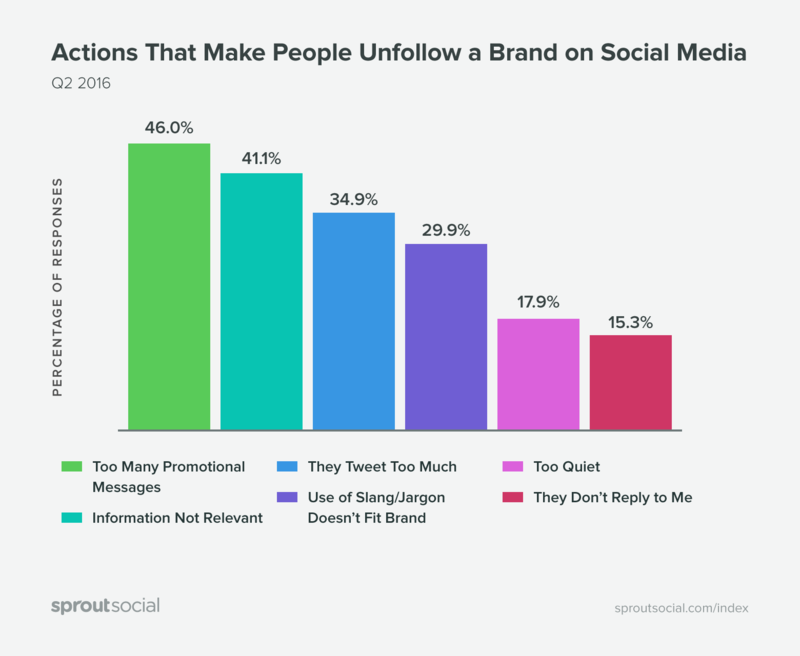 Not only that, but 46% of people are willing to unfollow a brand for sending too many promotional messages. There’s no magic ratio of promotional to non-promotional social media content you should share. You’ll have to find the right cadence for your audience. To be on the safe side, aim to share much more non-promotional content than promotional. 14. 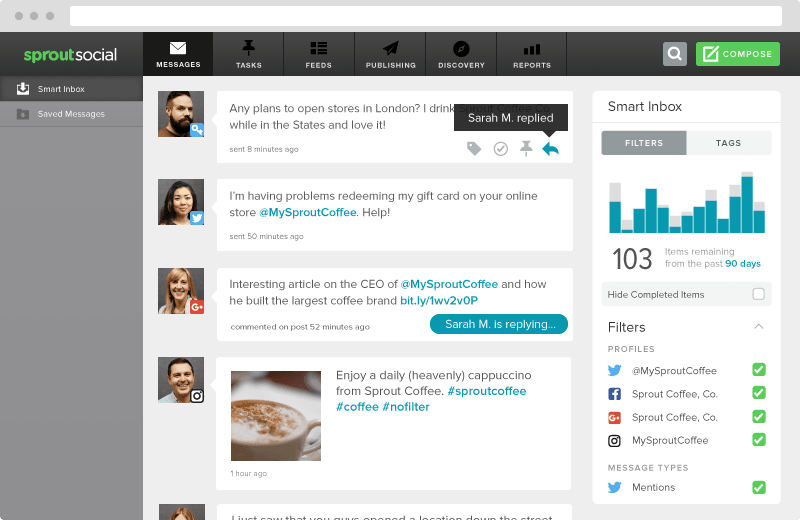 Do I Need a Social Media Management Tool? Here’s why: Native social media apps are great for personal use. In fact, it’s what they were made for. But as a business, your needs are a little different. You often need to schedule content in advance, look at in-depth analytics to measure performance and work in teams. The native social media platforms weren’t built for that, which is the reason why social media management tools like Sprout Social exist. 15. Should I Outsource My Social Media Marketing? Here’s why: For brands that don’t have the resources to put together social media campaigns from scratch, working with an agency can be a smart move. Social media agencies understand the nuances of different networks, and can often help you be much more effective. On the flip side, you don’t want to take a completely hands-off approach. That’s why often times social media agencies prefer to work with clients, rather than completely take over everything. Nobody knows your brand like you, so you should always have a hand in your social efforts. But there’s nothing wrong with getting help from specialists. Have a question that’s not answered here? Comment below or Tweet us and we’ll see if we can answer it for you. Remember, there’s no such thing as a dumb question, so ask away!